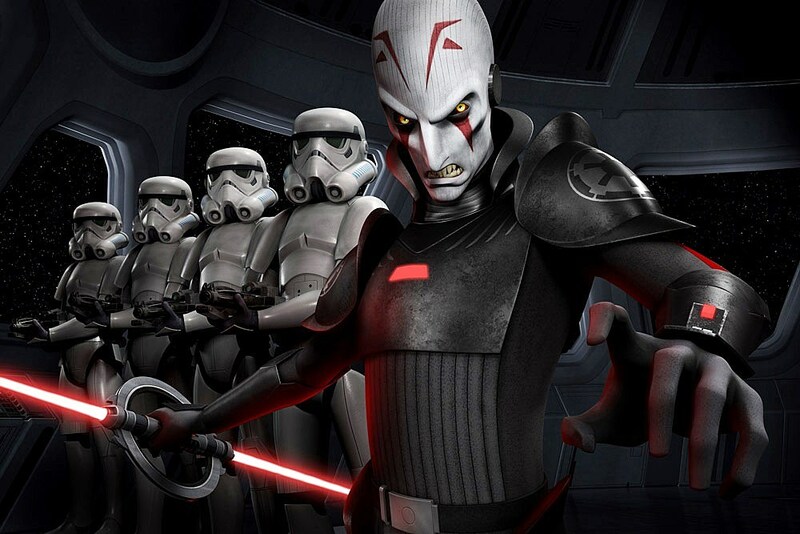 ‘Star Wars Rebels’ Details Revealed: Meet the New Jedi-Hunting Villain, The Inquisitor! 'Star Wars Rebels' had been kept largely a mystery since its announcement, beyond a time frame and a few scant setting details, but the animated series' presence at this past weekend's New York Comic-Con force-pushed the lid right off. Not only do we know when and where 'Rebels' will take place in between 'Revenge of the Sith' and 'A New Hope,' but also that the Jedi-hunting "Inquisitor" will play a major part! Though few details are known of the villain beyond being "tasked by Darth Vader to hunt down the remaining Jedi Knights," supervising director Dave Filoni recently previewed the series in a new video showing off both new and returning staff for the series, as well as the significant role Empire villains and designs will play in the new series. From what we can tell, the Inquisitor seems to belong to the Pau'an race of Utapau, as seen greeting Obi-Wan in 'Revenge of the Sith,' as played by 'Mad Max' icon Bruce Spence. So what other details were we privy to from 'Star Wars Rebels'? Well, for one, we know for sure that 'Rebels' will pick up 14 years after the events of 'Revenge of the Sith,' and five before 'A New Hope,' largely set on the outlying planet of Lothal. The Empire has for the most part been welcomed for its stability throughout the galaxy, though the push to a more desolate frontier world like Lothal brings mixed reactions, creating the titular rebels. Lucasfilm's Pablo Hidalgo also previewed that 'Rebels' would return to the underdog sensibility of the original trilogy, noting that the rebel resource strains would make issues like starship repair much more pressing than in previous series like 'Star Wars: The Clone Wars,' wherein the heroes belonged to "the establishment." Expect plenty of insight into the 'Clone Wars' mythology as well, as clone troopers will be differentiated from the more familiar stormtroopers, whose inspired patriotism proves more valuable to the Empire than the programmed instructions of clones aging at twice the normal rate. As for the Jedi element, Hidalgo explained that the writing will keep cognizant of "Order 66," and the significance of Luke Skywalker being among the last Jedi by the time of the original trilogy, though not without justifying the Inquisitor's purpose in hunting down the last of the order. That may eventually put Darth Vader on the rebels' radar, as well, given that “the more successful they are, the bigger bosses they have to fight, so to speak." We’ve already seen concept art of the mentioned Millennium Falcon-esque “Ghost,” which will act as a central location, but no voice cast has been made official. Though, we recently heard Freddie Prinze Jr., ‘The Butler’ star David Oyelowo, Vanessa Marshall, Taylor Gray and Steven Jay Blum were on the short list. Picking up where the now-canceled ‘Clone Wars‘ left off, ‘Star Wars Rebels’ will feature on the creative side screenwriter and producer Simon Kinberg (‘X-Men: First Class,’ ‘Elysium‘), who’s writing the first episode, as well as ‘Clone Wars’ supervising director Dave Filoni and ‘Young Justice’ producer Greg Weisman. You can check out the Inquisitor for yourself in the video above and the photo below, and in the meantime, tell us what you want to see from 'Star Wars Rebels' in the comments! Source: ‘Star Wars Rebels’ Details Revealed: Meet the New Jedi-Hunting Villain, The Inquisitor!